This is my official January 2016 Net Worth Update. 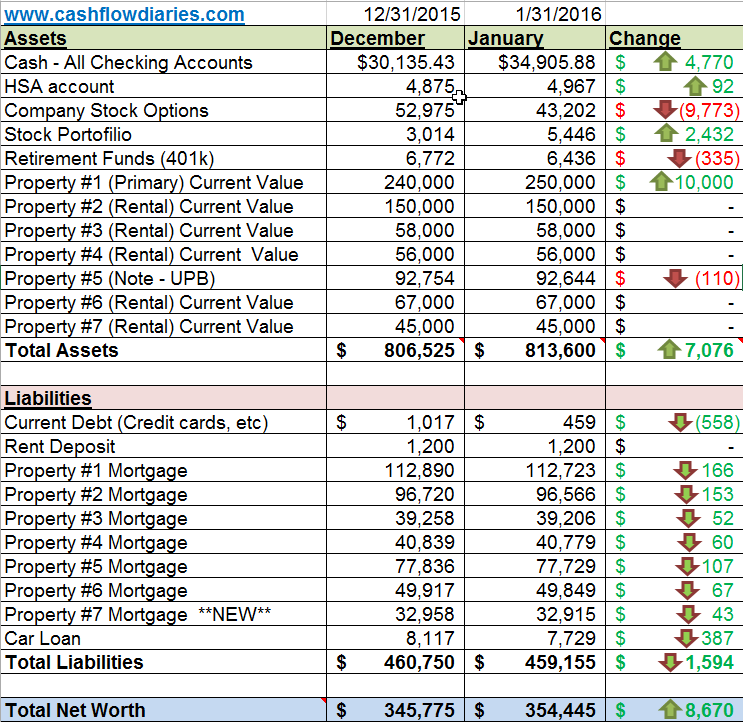 Below are my actual numbers for ALL my investments and liabilities as of 01/31/2016. Explanations and quick summary below chart. If you would like to see my previous months net worth posts, please visit my Net Worth Tracker. 2016 is in full swing and I am feeling super motivated to reach new levels of success. I still can’t get over how good my 2015 was and it will be hard to top that but I have some big ideas for this year that all revolve around making me more passive income. Now I know that money is not everything but for me, having more money means being able to generate more passive income. I truly think passive income is the key to happiness and my mission for 2016 is to grow my passive income streams to new heights. I have a few ideas that I will be sharing in a future post about what I will do to try to do this so stay tuned. January was a very busy month for because I spent a lot of time researching, researching and researching how to make more passive income. I also spent a lot of time finalizing and booking things for my wedding I will be having later this year. Yep, I am getting married this year and it should be pretty epic. I’m excited about it and I love my fiance to death but I am not going to lie, I am not excited about how much it is going to cost me. But it’s okay. I have accepted it and am moving on. Now let’s talk about what happened with my net worth this past month. It went up!! Which is awesome! The main reason it went up though is because every January will be the time that I re-calculate the property values on all my investments. The only property that I felt comfortable increasing its value was my primary home. I want to be super conservative about property values and this property was the only one that I know for sure went up in value. I could not gather enough data or conclusive evidence that any of my other property values went up. If it were not for this property value hike, I would have been in the RED. The stocks that I own are killing me and I dropped over 10k of my net worth alone just in stock values. You are probably aware that so far in 2016, the US stock markets are not starting strong and there seems to be a lot of turmoil and doomsday sayers out there regarding this year’s outlook on the markets. I honestly also think that 2016 will not be a good year for stocks. We’ll see what happens. I am a rookie when it comes to trading or the markets in general so pay attention to anything I say regarding this. Real estate is definitely what I am more familiar with and will continue growing my real estate investments forever! Now let’s get to the breakdown of each asset. Assets: Explanations of each of my assets. My cash position is the only really consistent asset that I have that pretty much goes up every month. Thankfully and I am very grateful for this, I have a great job that pays me a decent salary. 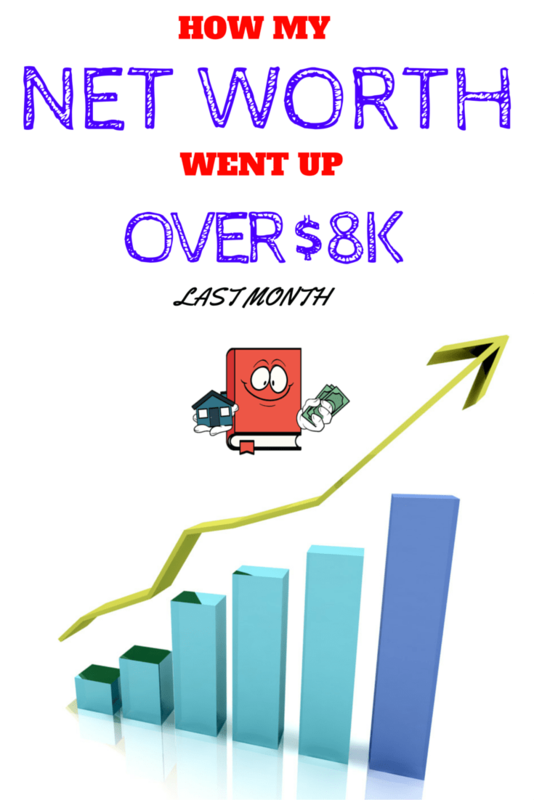 So my salary alone plus over $2k per month I get in passive income from my real estate properties makes this number go up nicely each month even after pay all my bills!! My cash as noted above in the spreadsheet consists of two different checking accounts. My normal checking account and my REI (Real Estate Investing) checking account. Very Satisfied! This was just my normal monthly contribution. My HSA deductible is $1300 for the year and I have close to $5k in this account so with that being said, since I am maxed out already I am only taking a very small amount out from my day job paycheck to fund this account. Any money after that deductible will just sit in that account not making me money. I know I can use the money that I don’t put in there to get better returns as long as I invest it in more real estate. This number should increase each month a tiny bit. Satisfied! Can you say OUCH!! Jeez these darn stock options are killing me. It does not make any sense to me because the company has not reported any negative earnings and there has not been any bad press about anything. I don’t know why this stock went down so much but I am going to go ahead and say it had to do with the market in general and that most stocks probably went down. Im hoping this goes back up after this up and coming earnings call that should be positive. We’ll see! These are stock options from my day job. I am fully vested. I may end up selling a bunch of these in the future if it hits a certain price. I would like to use the money to buy another rental property. I’m not in a hurry to sell it so I will play along with the market and see what happens. Not Satisfied! I just recently started having an additional stock portfolio and although this number looks to be positive. It really isn’t! Here is why. I have deposited an additional $3,000 into my TradeKing account in January. This makes it more than what it was last month when I first opened the account. So overall, i’m actually down about $600 because I have a total of $6k into this. I have purchased a few different stocks and 1 ETF which I will shed more light on later in the future. Satisfied! I lost a little money in the old crappy 401k but it’s not really a big deal because I do not contribute any money in this account. I made an executive decision awhile back to take money out of my 401k and no longer contribute any more money to it. Mainly because I do not get matched contributions from the dreadful day job. But also because I KNOW I can make better returns using that money on rental properties. I really don’t like the idea of having an account that punishes me to take money out because of age. Satisfied! I have updated the value on this property and it went up $10k. This really helped my January net worth update and put me in the positive. Thankfully this house is in a great hot market and I have very good equity in this property. Over 100k worth! This is my primary residence. The market I live in is extremely hot and I expect the appreciation on this house to continue to grow however I will only update the market value once a year, in January of each new year. Satisfied! Here are more details on this future investment property. No issues, repairs and rent paid on time on this one for January. This is my first rental property. It used to be my primary residence. I expect gradual appreciation from this property as well because it is in the suburbs of this HOT market I live in. Love me some HOT markets! 150K is about what its worth now based on MLS comparisons. Satisfied! Rent paid on time. No issues or repairs. This is my first turnkey rental property I purchased out-of-state. I do not expect much appreciation on this property. I purchased this for CASH FLOW purposes only. Satisfied! Last month I was paid late on this property by my property manager which I did not like one bit. I mentioned dropping this property management team and I still plan on doing so. The lease for this tenant is up in April so I will soon be in the process of getting this transferred over to a new PM. This property is now all caught up though in rent payments and there were no repairs or any problems for January on this one. This my 2nd turnkey rental property. I do not expect much appreciation on this property. I purchased this for CASH FLOW purposes only. Satisfied! Mortgage paid on time. No issues. This is a note that I own from a house that I sold via owner finance. If you notice though, the reason why this asset will continue to go down from the spreadsheet above is because it is a note and the principal balance on it goes down each month as the buyer pays me. Remember, I’m the lender on this one. Satisfied! I got Janury rent paid on time. No repairs, no problems. This is my 3rd turnkey rental property, I purchased it in early June 2015 and I absolutely love this house. I do not expect much appreciation on this property. I purchased this for CASH FLOW purposes only. Satisfied! Rent paid on time, no issues, no repairs. This is my most recent turnkey rental property, I just bought this in late October 2015. I purchased this property also for CASH FLOW purposes only. I am not expecting appreciation gains on this one. Satisfied! Liabilities: These are self-explanatory so I wont dive too deep into these however I would like to include the items below for informational purposes. I only use one credit card (rewards card) that I use to purchase my everyday expenses. I pay this off in full every month. I am receiving 1.5% cash back on this card and am very pleased with it. Satisfied! I purchased this vehicle before I had the proper knowledge on how to be totally awesome with finance and investments so that is the only reason why I have this loan. If I knew then what I knew now, i would have purchased a used vehicle all cash. It is not worth it to me to pay this loan off because the interest rate on this loan is 2% and I would rather use that money to buy more rentals where I will make a much greater return. I will continue to pay it down slowly. Satisfied! I really do love this chart, it looks great and its nice and big. The big increase at the end is from where I updated my property value on my primary residence. That is exactly what I want to see each and every month in this chart. If you want to set up and track your net worth online like I do, create a FREE account at Personal Capital . There you have it folks! How was your month? Subscribe here if you would like to receive emails on future posts including more net worth updates. Nice job on your progress. I completely agree with your philosophy of owning tangible assets that you have some control over. Real estate is not always 100% passive, but it has a ton of advantages for people that want to go that route. You get cash flow today and into the future that is inflation resistant. You get principal reductions. You get tax advantages (primarily depreciation). And the return is typically much higher than the return of paper assets. Granted you have to deal with tenants and maintenance workers etc which can be challenging at times. But the payoff if you work at it is early FI. And that is priceless. I was fortunate to become FI a couple of years ago through real estate investing. It is really nice having control over my day and not reporting to someone. Aside from jobs taking too much time in our lives, they are typically not drama free. Creating an independent income stream takes the power back. There is no worse feeling than being 100% reliant on a job for basic expenses. I couldnt have said it better myself. Real estate is my passion and I plan on reaching financial freedom from that mostly. You are an inspiration for investors like myself who are still in the process of reaching that freedom. Congrats to you! That is awesome!! Thanks for coming by ML! Looking good. Just curious on your assets and liabilities. You have your car loan as a liability. Why not list as an asset as well to balance off the liability. I realize it makes you no money but you could sell it for money. Just wanted to know because I have my car value factored into my net worth, minus the loan. Thanks a lot! Really appreciate the feedback. I am really anti adding my vehicle as an asset. I technically should be adding it but I dont want to because it will always depreciate and I feel like if I add it, I will be giving myself false hope that my net worth is higher then it really is. If that makes sense! Really just personal preference though. Good job! Little by little you are every time closer to half million! Thank you for sharing! Hi Francisco, I didnt realize you were in the UK. Wow that is very expensive property over there. You should try and find a run down house and fix it up yourself. Would be better! I am in the process of saving for a down payment as well for a new rental property. Hopefully I will be buying another one in a month or so. Hi Bryan, Thanks so much! Honestly I don’t think I would be a successful real estate investor at all if I didnt have those kinds of cash reserves. If and when hard times come, I will absolutely need that kind of cash to bail me out. I think there are a lot of failed real estate investors out there because of the lack of cash reserves. But yes it is also nice to have some nice cash around to take advantage of any opportunities that may arise which is great! I feel comfortable right now with the cash I have but I would feel much better I just had about 10k more sitting around. Thanks for the insight. I really appreciate it! Loving it man! You smashed it out there, good on you for researching more passive income opportunities as well..
Should really get a group together and brainstorm ideas / swap notes on due diligence, your thoughts? Keep it up though Alex, have you set a date yet for the wedding too? Thanks Jef. I am going to concentrate really hard this year on increasing my passive income so I am excited about that. We should definitely collaborate on it. I am actually going to write a post about my ideas soon that will show all the ways I plan on utilizing to increase the cash flow. The tough part will be actually putting them into action. Yes sir, the wedding date is set for mid may. We decided to do it sooner than later. Get it knocked out the way. Probably doing the honeymoon in June in Europe. Awesome, you should set up a Facebook group for passive income ideas and motivate each other to put them into action..
That’s a pretty tidy portfolio of rental properties and I’m amazed to learn that they are a pretty solid investment option. I haven’t had any experience with investments in rental properties because I think they’re a bit risky, but then, which investment isn’t. 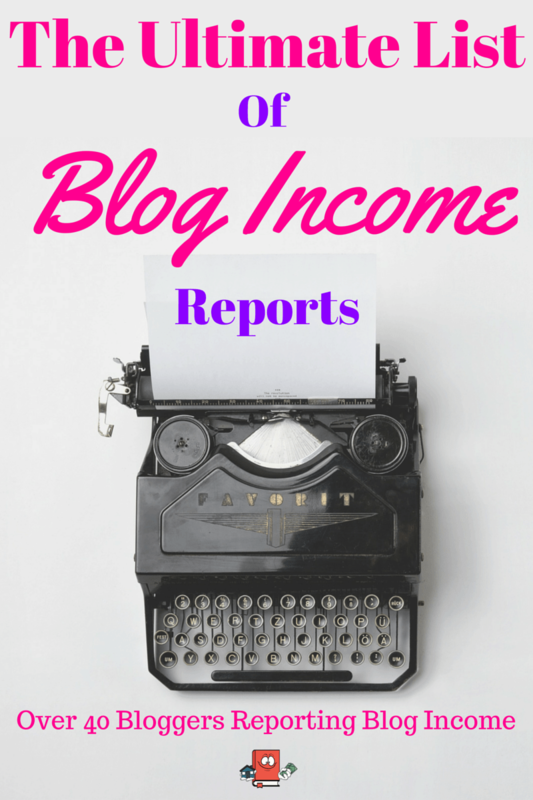 Good job on finding a great source of passive income!! Nicely done, receiving rents on time must be a great feeling. 🙂 Any reason why you have car loan under liability but do not track the value of your car? I don’t track our car as an asset either though. Hey Tawcan! I am really anti adding my vehicle as an asset. 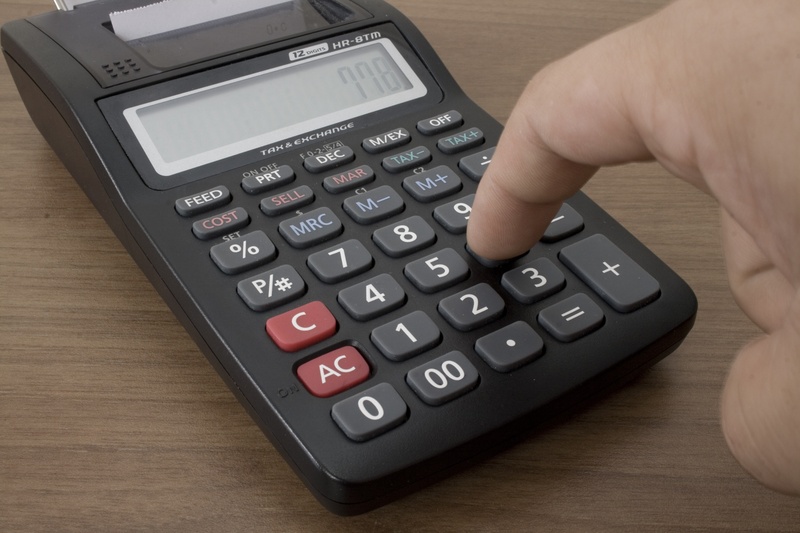 I technically should be adding it but I dont want to because it will always depreciate and I feel like if I add it, I will be giving myself false hope that my net worth is higher then it really is. If that makes sense! Your net worth update is a perfect technique to keep us interested in your journey. I have enjoyed reading your Cash Flow Diaries; got a lot of valuable information from your experiences. Hopefully, you will keep writing and I will keep reading. The turnkey industry is somewhat challenging, but we are closing on our first rental property this month. We do prefer to get a higher COC ROI, so I am sure we will journey away from turnkey at some point. Thanks for all your advice. The turnkey rental property industry is definitely challenging and its hard to find good returns but if you look hard enough, they are out there. I’m glad to hear you say you aren’t putting more money in 401k to instead use it for rental property investing. I have the same approach and people think it is crazy. I have a hard time explaining to them that the tax benefits are just as good as any retirement account. How do you explain it to people? Or do you just let them think you are crazy? Yep, you and I are in the same boat. I just tell people that I get higher returns by putting the money into rental properties then what the 401k gives me. That usually does the trick but the only ones that agree with me are other real estate investors. Nicely done, keep trucking along. I’m in the same position, trying to increase my passive income through hard money lending too. Great job! Thanks Tracy! I think you might be on to something. I have always wanted to be a hard money lender but I just don’t think I have enough cash to do it plus all the rules behind it scare me because I I don’t know enough about those as well. If you write a blog post about how you are doing it, please send it to me. Would love to hear about it. IT seems like your headed in the right direction in Net worth even with a down stock market. For me personally I would diversify more into paper assets, instead of real estate as to reduce portfolio risk. I think a 50/50 split between market investments and real estate investments is safer. Good luck. Thanks EL. So far the direction has been going up. I have only ever had one negative month so far. The stock market is crazy! 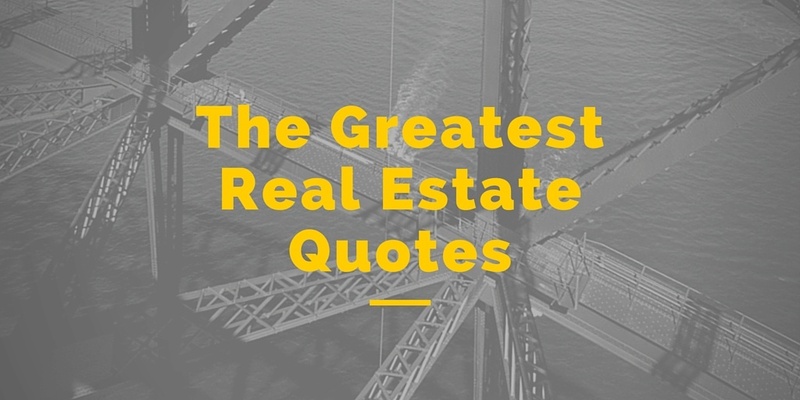 I would much rather have more of my money in real estate but it does make sense to diversify. I appreciate the input!